Flat headed slotted cap screws are designed to be seated in countersunk holes, and align flush with the surface of the assembly when installed. 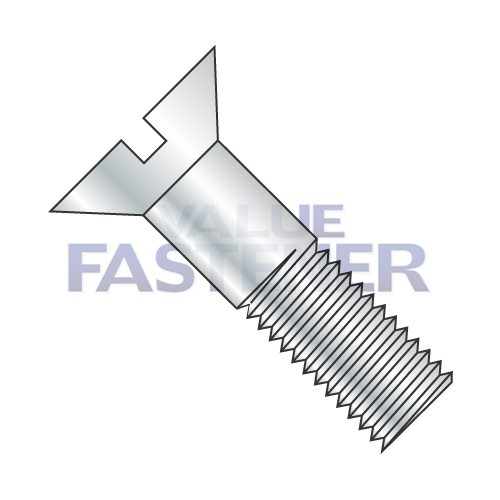 A flat headed slotted cap screw includes a flat top surface, a milled slot, and a conical bearing surface with a head angle of 82°. Flat slotted cap screws are most often used for assembling close tolerance machinery where head clearance is critical. Value Fastener stocks flat slotted steel zinc coated screws in a variety of sizes and lengths to meet your needs; see individual product listings for additional information and specifications. Order today, request a quote, or contact us for flat slotted cap screws. Why Use Zinc Coated Flat Slotted Cap Screws? Flat slotted steel zinc coated screws are far more corrosion resistant than standard, untreated steel cap screws. Our flat slotted cap screws feature a thin, durable zinc coating that is recommended for wet or otherwise corrosive indoor applications; they are not intended for outdoor use. We are your #1 source for fasteners of all shapes and sizes. We have the flat slotted cap screws you need, along with a huge selection of other screw options, making it easy to find the right fastener for your application. Order the slotted cap screws you need, request a quote, or contact Value Fastener to learn more.